What version of Mail do I have installed on Mac OS X? 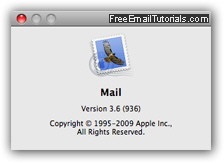 Free Email Tutorials › Mac Mail › What version of Mail do I have installed on Mac OS X? Mac Mail is the default email program for Mac OS X, and comes bundled with your machine, just like Outlook Express came with Mac OS 9 or Windows XP, and Windows Mail for Windows Vista. - no need to download it or install it. The base version of Apple Mail you currently have installed is in part determined by your operating system version (10.4 Tiger, 10.5 Leopard, or 10.6 Snow Leopard, most probably - if you are not sure, see "What version of Mac OS X do I have?" to get your major and minor version number). This tutorial will show you how to see what version of Mail you are running on your Mac. What version of Mac Mail am I running? If needed, start by launching Mac Mail (click on the Mail icon in the dock, or press Command+Space to launch Apple Mail from Spotlight by typing "mail" and hitting Return on your keyboard - assuming it is the top hit as shown below). An about box (new window) will open, and show the version of Mac Mail you currently have installed on your computer: the screenshot below shows Apple Mail for Mac OS X 10.5 Leopard, with Mail version 3.6 ("3" is the "major" version, and "6" is the minor). Mac OS X version 10.0 (Cheetah) - Mac Mail version 1. This is a notable release since, before that point, Mac users typically had Microsoft's Outlook Express for Mac as primary email program (a free download, which can still be used on OS 9). While not released at the time of this writing, Mac Mail version 5 will ship in summer 2011 bundled with Apple's next operating system, Mac OS X 10.7 "Lion".